Beside conducting the series Philosophy and Art at the H2 – Center for Contemporary Art, Augsburg, an important field of research, work, personal concern and enthusiasm for me is doing so called »Kunstvermittlung«* , also for the »H2« and for the tim, the State Textile and Industry Museum Augsburg (documentation upcoming). 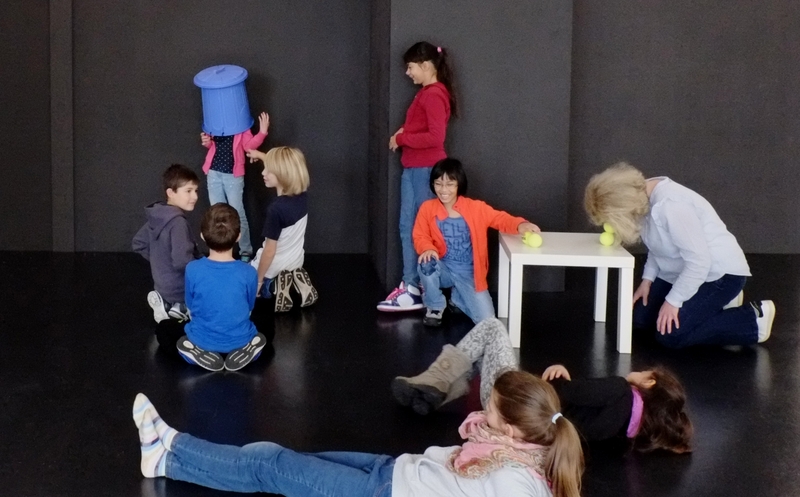 I am doing »Kunstvermittlung« for adults, juveniles and children. Below an exemplary documentation of a workshop, done for children from an elementary school, the St. Georg Grundschule Augsburg, teacher Alexandra Knöll, class 4a (2017). All images done and shown with permission of the children, the parents and the school. The workshop took place during the show bilder fragen, starting particularly from works done by Burgard Blümlein, leading via a performance of a specific work from Alina Szapocznikow to a discussion of the work of Joseph Beuys, combinded with several performances of »One Minute Sculptures« by Erwin Wurm. See notes below the images, a more detailed description (upcoming) and the teacher's feedback below the image section. *The term »Kunstvermittlung« is actually difficult to translate. A rough translation would be »art mediation«, but the term »mediation« is usually used in other contexts. A more conservative sounding term would be »museum paedagogy«. Below: We did start from a work by Burgard Blümlein, disussing the idea of sculpture he provides by the combination of stones and soaps. Related to the idea that sculpture can be seen in the broadest sense as any process of (trans-) formation, it becomes clear that washing your hands with soap can be also seen as a sculptural process. To enable the children to do sculptures in this sense, I did provide them chewing gums without any explanation. Afterwards they displayed their gums on a table. With the sculptures on view I did show images of the »chewing gum sculptures« of Alina Szapocznikow. Starting to talk about Joseph Beuys with the children had been well grounded at this point through letting the children experience the process of »sculpturing« themselves with their chewing gums. The »gum-sculptures« on view, particularly in comparison with the »uniform« gums taken out of the box, we already did talk about individuality and conformity related to manipulative aspects of capitalism and possibilities to act and create in an individal way. From here on, it has been a little step to be able to talk about Joseph Beuys' idea of the »social sculpture«, regarding the »Fettecke« as an exemplary case for a reflection about »frozen« forms like the »right angles« of a room and the formability of the fat. With an understanding of the exemplary case of the »Fettecke«, we had been able to disuss further works like the »7000 Eichen« and also »Das Ende des 20. Jahrhunderts«.